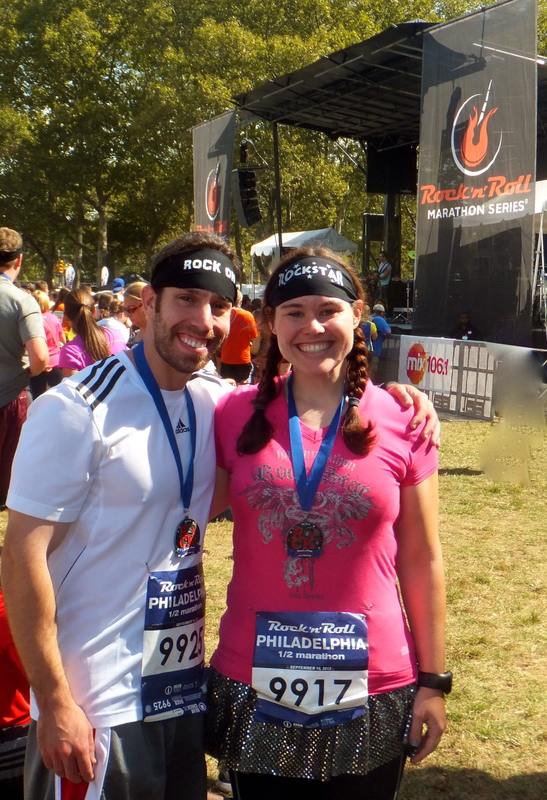 This past weekend, Todd and I ventured into Philadelphia for what was a pretty big race. 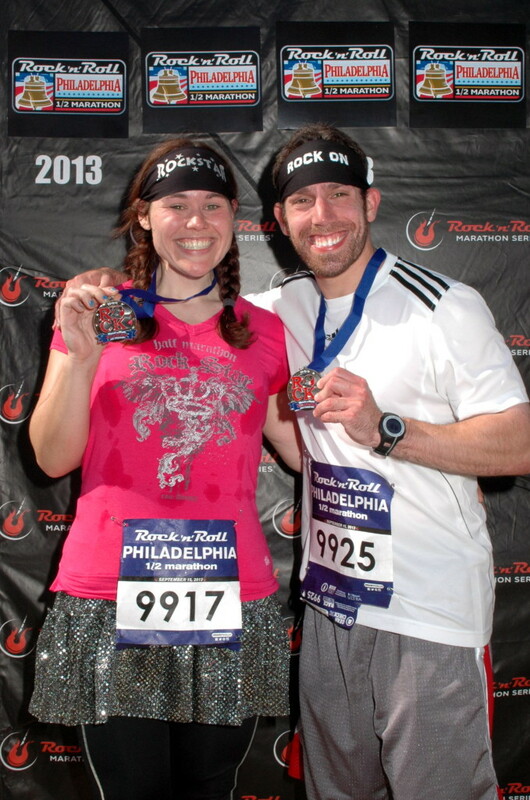 For him, especially…since it was his first half marathon! 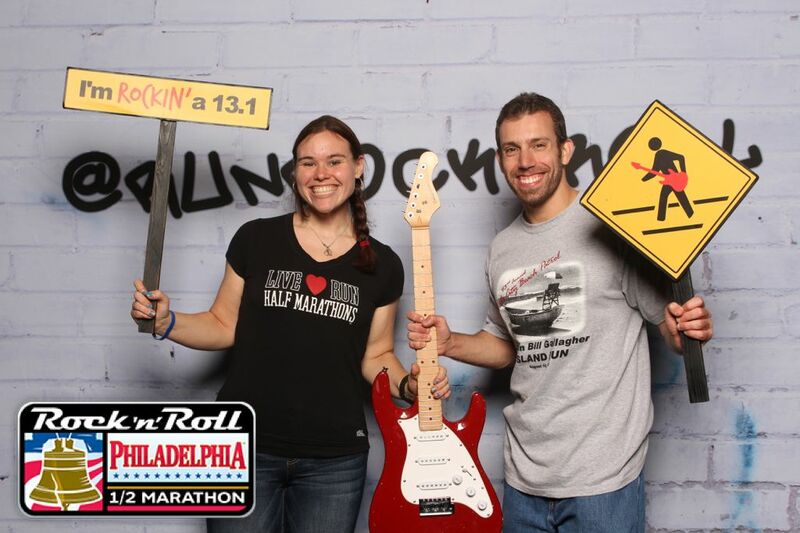 I’ve been wanting to run a race on the Rock ‘N Roll series, and since it seems the two of us will take any excuse for a race-cation, we made sort of a last-minute decision to take on this half marathon. 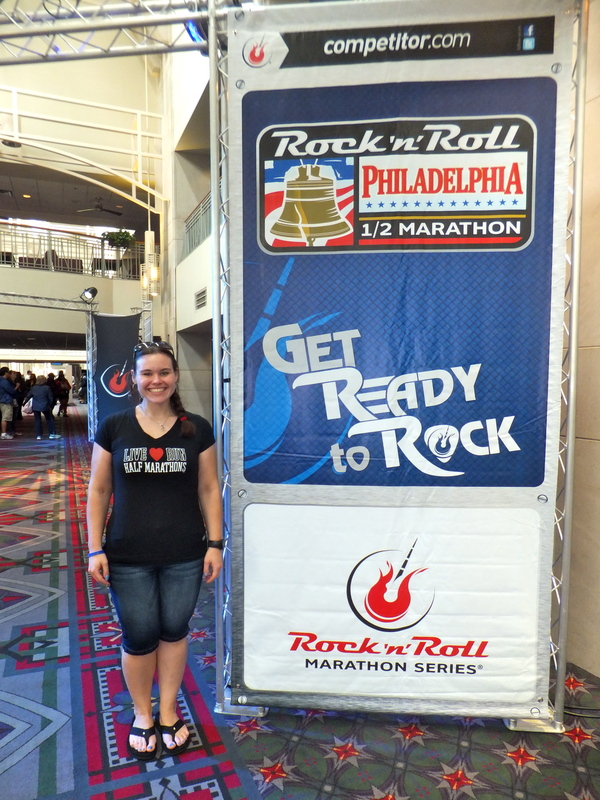 We arrived in Philly early on Saturday morning for the expo, which was let’s just say a tad calmer than the runDisney expos to which I’ve become accustomed! 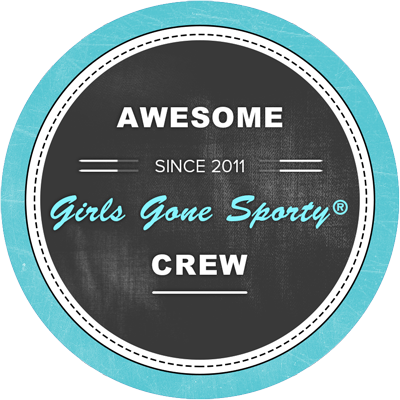 After picking up our bibs and tech shirts– which, I have to say, I quite liked! — we I did some shopping, and then, as per my usual M.O., looked for photo opportunities. 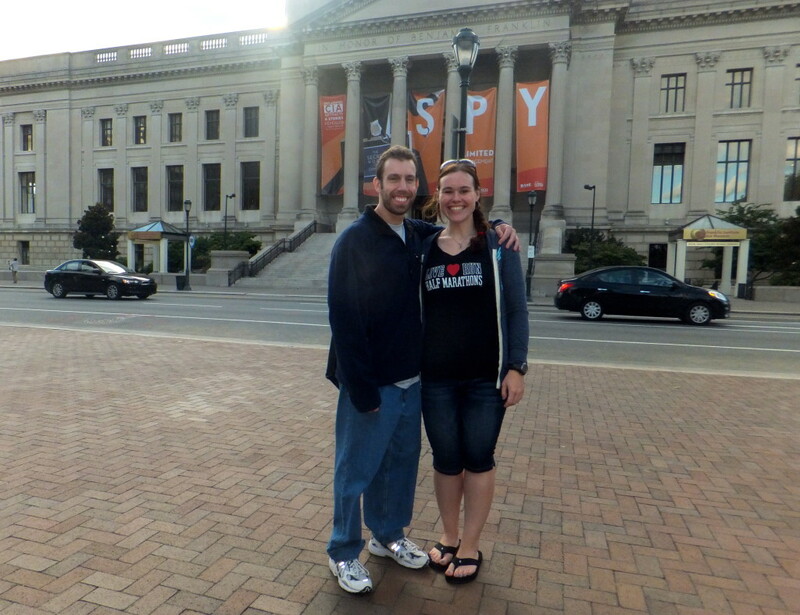 We then spent some time at the Franklin Institute, and walked around the city quite a bit…always a good idea to spend the entire day before a half marathon on your feet, no? Towards the end of the evening, I felt that my hips had become really tight…usually a pain I feel after one of my Taekwondo classes (which, lets just say, require lots of “10-count splits”), but rarely just from walking! I was a little concerned, but figured I’d use The Stick and do some stretching and be good as new for the morning. 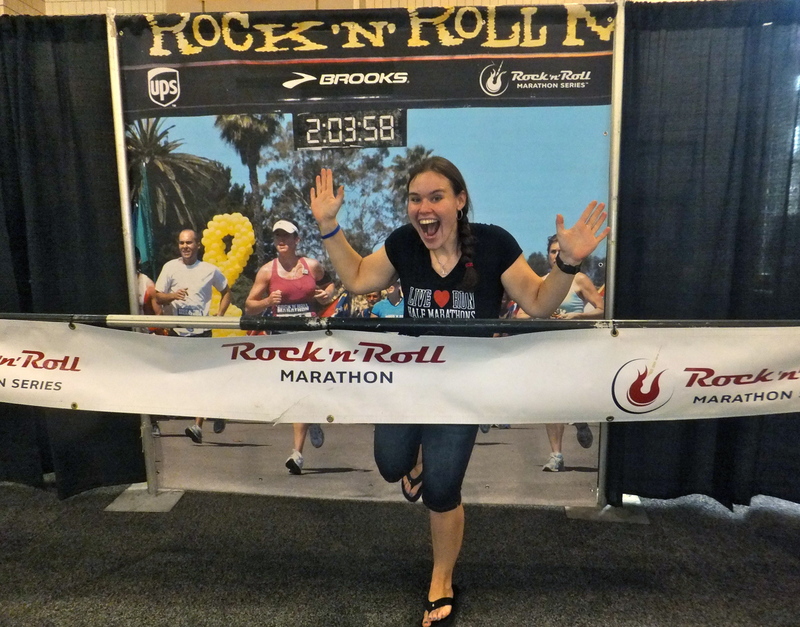 After a pre-race dinner at the Hard Rock Cafe — because it just seemed appropriate! — we went back to our hotel to get plenty of sleep before the race. Fortunately, our hotel, the Four Points Sheraton, was within walking distance, so the following morning when SOMEONE took forever to get ready…and then forgot his headband (I already have him hooked on Bondibands, ha! )…and then forgot his fuel…we still made it to the starting line just in time. There were about a zillion corrals, and it was pretty much mass chaos. With a field of some 20,000 runners, no big surprises there. We did manage to squeeze into our corral, number 9, and then waited for the race organizers to get this thing started. Unfortunately, it was while standing around in our corral that I knew the previous day’s hip/leg soreness was likely going to pose a problem for me in this race. Everything felt really tight, and I hoped that running the first few miles might help loosen my legs up a bit. Honestly, I wasn’t overly concerned, though, because I didn’t really have any major time goals for this race. 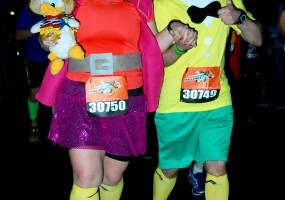 After completing the Dumbo Double Dare just two weeks prior (recap here! ), and deciding to give my legs a bit of a break before jumping into my hard-core Dopey Challenge training — I did a couple of short runs after returning home from California, and that’s about it — this was purely a “for fun” race for me. With a half PR of 2:03, and other previous (non-Disney) half marathon times of 2:07 and 2:11, I figured I’d come in somewhere between 2:05 or 2:10, max, and that was just fine with me. 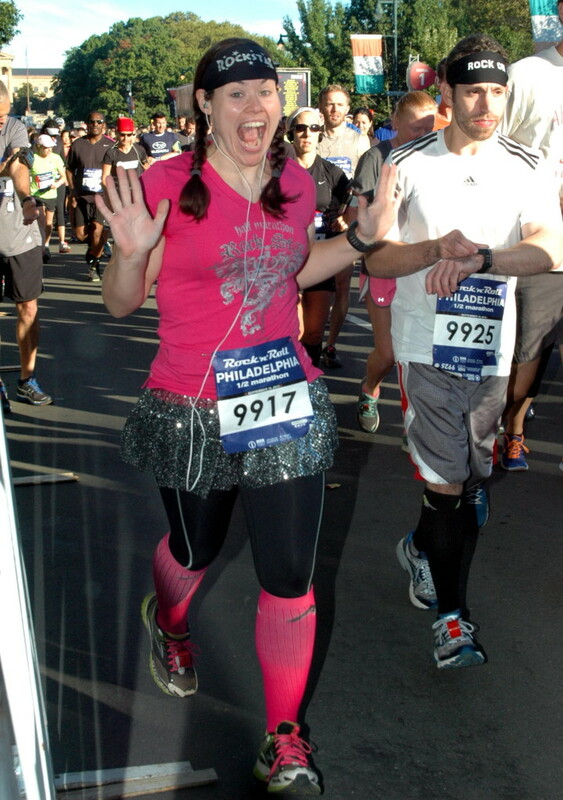 Who here is a serious runner…and who is just a big idiot? 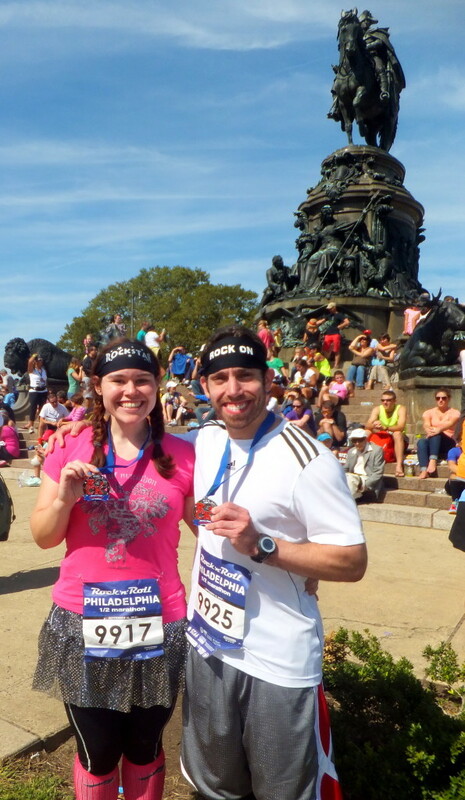 Honestly, I was far more concerned about making sure Todd was okay — he had been dealing with some foot pain for a week or two prior to the race, which threw off his training a bit — and since it was his first half marathon, I decided I’d stick with him. You know, just to make sure he didn’t drop dead on the course or anything. 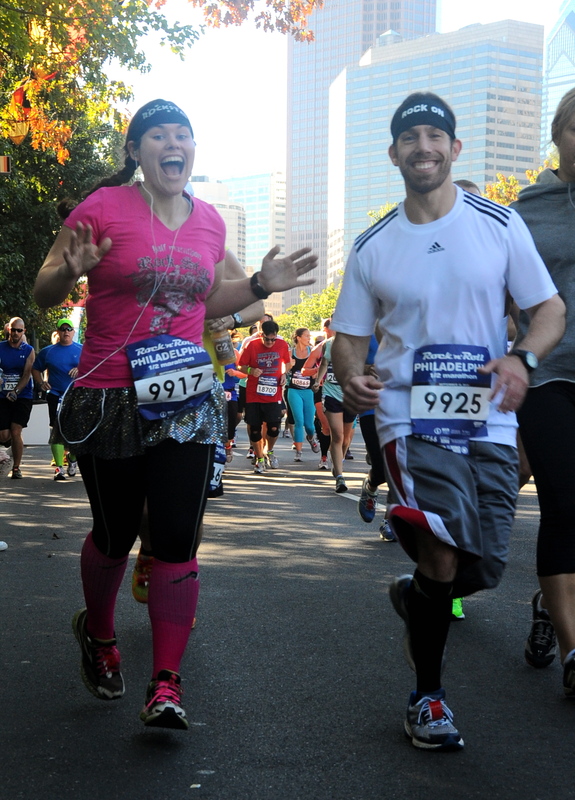 Plus, I was really excited to run together! 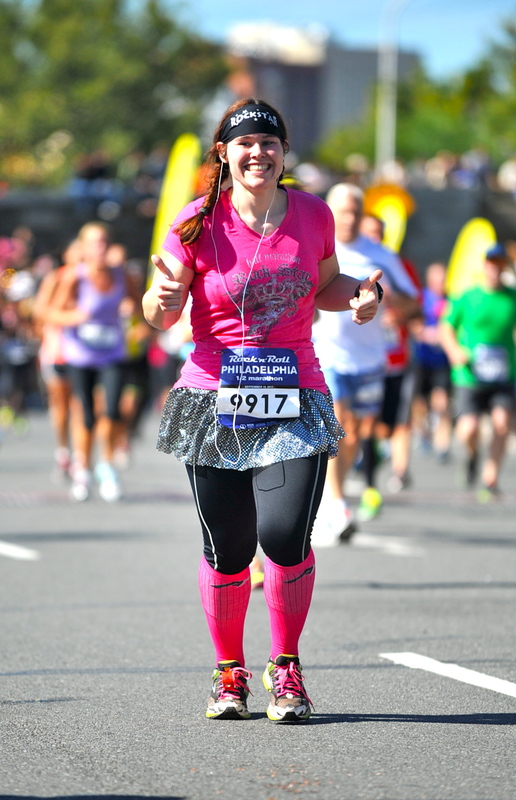 We started the race at a very slow pace for me — I am 100 percent a positive splits kind of runner, and always go as fast as I can, for as long as I can…and then I just focus on maintaining a steady pace in the final miles. He wanted to take the opposite approach, so I decided to give it a try and kept it slow and steady in the beginning — never hurts to experiment with a new race-day strategy, right? 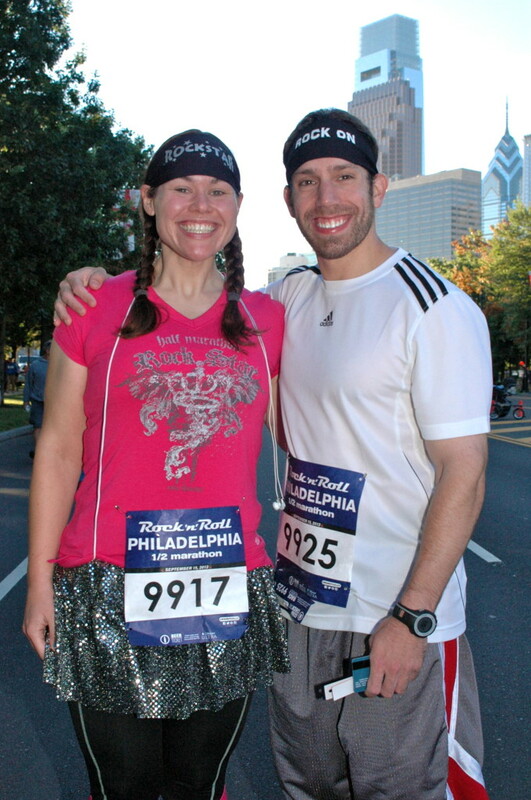 Truth be told, I didn’t mind at all…it was a PERFECT morning, weather-wise, I was enjoying the course (can’t remember the last time I was in Philly), and since I’ve never had anyone to run a longer race with me before, I loved having the company. 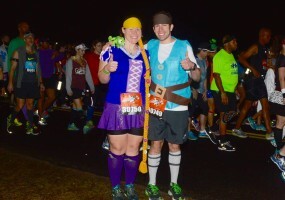 I was having, by far, the most fun I’ve ever had running a half marathon (not including Disney races, of course). Not to mention, the course was ridiculously crowded, so we honestly couldn’t have gone much faster even if we wanted to…unless the plan was to take out some fellow runners along the way. Which I’ve heard is not proper race-day protocol. One issue we did have was that the water stops were not properly staffed with volunteers; there were a few stations that were out of water all together, and many others where runners had to swarm the tables to pick up their own cups of water and/or Gatorade. Sounds easy enough, but in a race this large, it can get a little bit dicey. Other than that, though, it was turning out to be a great race. There was a ton of spectator support, which is always appreciated, and the course was nice and flat — just the way I like it! We ran through the center of the city and there were also lots of great waterfront views, which was really nice. There were live bands stationed throughout the course — the whole running a half marathon thing kind of cuts into your rocking out time, but I thought it was still pretty cool. In the early miles of the race, I had told Todd — who generally does run about a minute-per-mile faster than I do — that if he wanted to go faster, he should do so. I’d try to keep up, and if not, I’d meet him at the finish line. I know how personal running is…we all have our own goals and our own pace and our own plans for any given race, and I anticipated that since he was being extra-conservative in the first half of the race, he’d probably want to see what he could really do in the second half. Up until that point, my Garmin was clocking us in anywhere between a 9:30- and 11-minute mile, so I really had been taking it slow for me. However, my hips were still bothering me quite a bit and my legs were feeling really sore and heavy, so I knew that attempting to run faster might not be the easiest (or the smartest) thing for me to do at that point. But we had already made it through all of these miles together, and there was a part of me that really, really wanted to cross that finish line together. I see other couples do it all the time, and not gonna lie — I’ve always been jealous! I was really looking forward to that moment, so I told myself that no matter how much it hurt, I was going to try to make it happen. 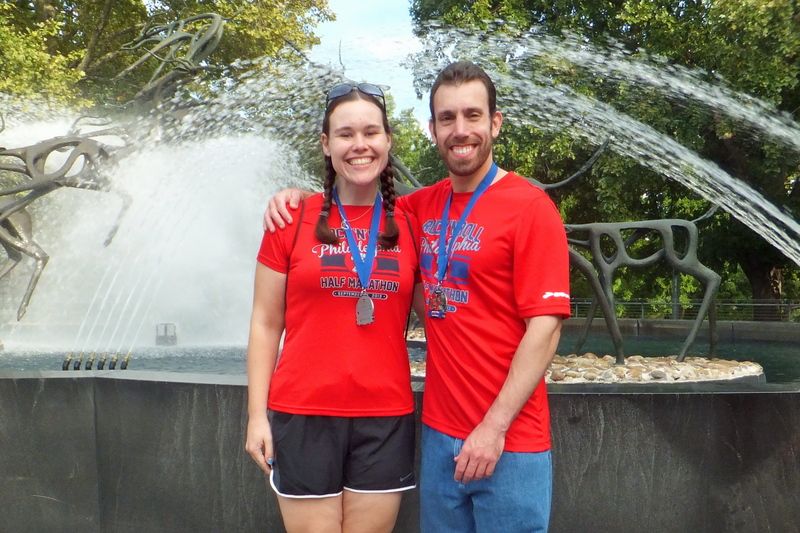 There’s something about running with someone else that really gets my competitive juices flowing, so even though I was REALLY not feeling up to it, I decided to be stubborn and give negative splits a try. Around mile 8 or 9, we picked up the pace to around a 9-minute mile, which was feeling very, very uncomfortable for me…even though it’s my usual race-day pace! My hips were killing me, my legs felt like lead, I was feeling surprisingly fatigued given how slowly we had been running earlier in the race, and…TMI alert…I really had to pee. But I refuse to stop for potty breaks in races unless absolutely necessary, so I tried to just ignore it. He’d get ahead of me, and then I’d pretty much sprint to keep up. I’d fall behind again, and then catch up. This continued for about a mile or so, and then, somewhere around mile 10, I lost him completely. My legs were hurting even worse than before, and my chest started to really tighten up — probably from running like a maniac to catch this guy! — to the point where I was practically slowing down to a walk just to feel comfortable again. 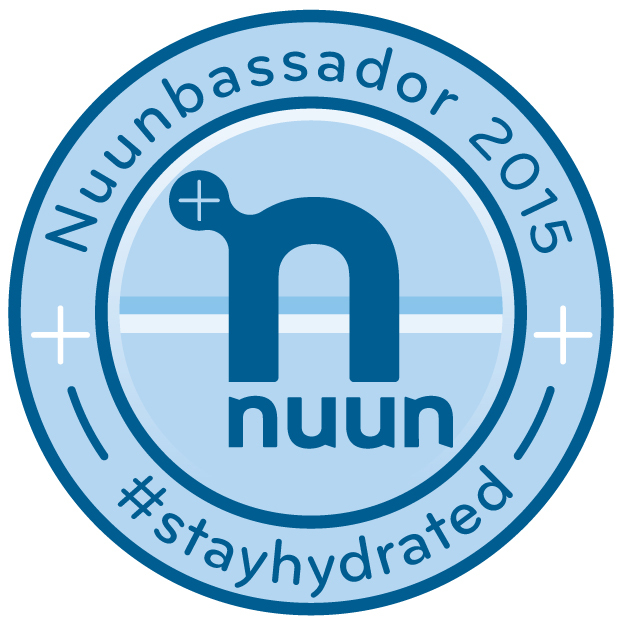 I NEVER stop to walk in races (except at water stations), but this time, I had to do it. My heart wasn’t pounding especially hard, but my chest suddenly felt really tight, and I’ve never experienced that before. It scared me, and I wanted to make it go away IMMEDIATELY (sad to say, it did not). 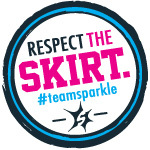 Even though I knew that running faster at the end of a race was not something I’ve ever trained to do, even though I knew I had just completed a 19.3-mile weekend race challenge, even though I knew this was supposed to be a “just for fun” race, I started to beat myself up for struggling so much. How dare I sign up for the Dopey Challenge when I’m over here having a hard time finishing a half marathon? And then I got mad at myself for getting mad at myself! It was all so ridiculous. 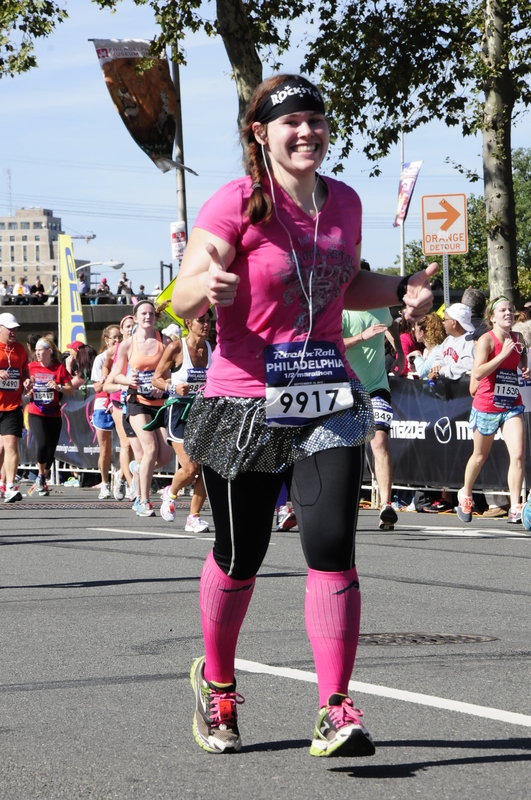 Still, despite my inner turmoil, I always seem to be able to put on a show for the MarathonFoto photographers. Those final three miles really hurt. Looking at my Garmin, I knew my “worst-case scenario” finish time of 2:10 was long gone. On a flat course, on this beautiful 60-degree morning, I was in the midst of running my slowest half marathon — not including Disney races. I was really frustrated that I physically couldn’t go any faster than what was turning out to be about an 11-minute mile, and PO’ed at myself for resorting to such negative talk when I knew damn well that I hadn’t even been trying for a PR in the first place. I was unbelievably relieved to see the final stretch of the race, and let the cheers from the spectators boost my spirits once again. 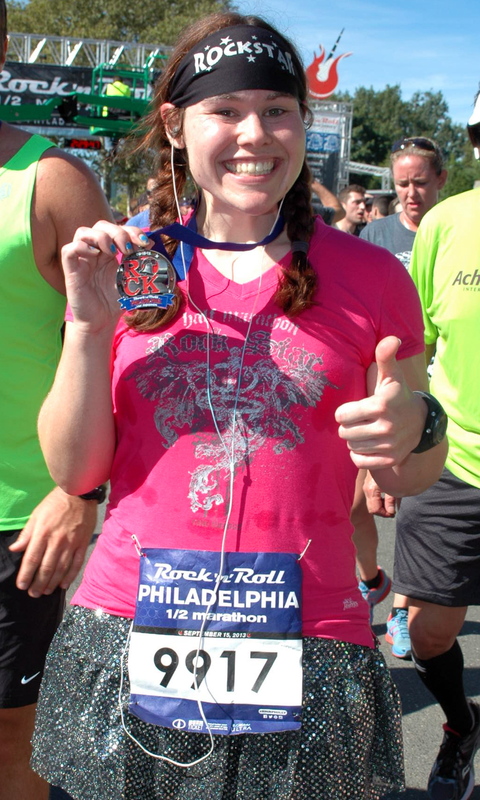 I crossed the finish line with an official time of 2:14:55…my worst half marathon time to date. However, I DID finish, and in my book, that is ALWAYS something to be proud of! I was handed my medal, which I think is pretty cute…and then all of the pain and frustration and anger I had been feeling in the previous 30 minutes completely disappeared when I found Todd with a medal around his neck. This was HIS race, not mine, and I suddenly didn’t give two hoots about what time I finished or how much pain I had been in. He managed to book it in those final miles, and finished his first half marathon in an awesome 2:06:57. I kept thinking about the way I felt after crossing the finish line at the Princess Half just 7 months ago, and felt so ridiculously proud and happy for him. He’s still pretty new to running, but has already come such a long way and made such incredible progress, and I was over-the-moon excited by his accomplishment. So we made our way through the finisher’s chute to take lots and lots of happy post-race photos! We also made sure to grab some goodies, including Power Bars, Gatorade, various chips, pretzels, and popcorn, and my personal favorite: chocolate milk! I was also approached by Ian from Philly 2 Goofy. 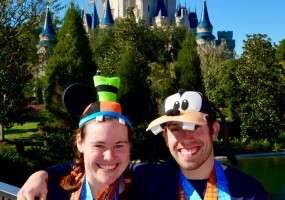 I’ve been following his blog ever since signing up for Dumbo — we share some similar experiences on our paths to becoming runners, and his journey to run the Goofy Challenge earlier this year has totally been inspiring me along the way! It was awesome to meet him in person. He also suggested stealing one of the empty boxes behind the various snack tables to help carry our loot, which worked out beautifully. After stopping for some more photos and listening to the post-race band for a little while, we got changed (gotta love my Shower Pill athletic wipes!) 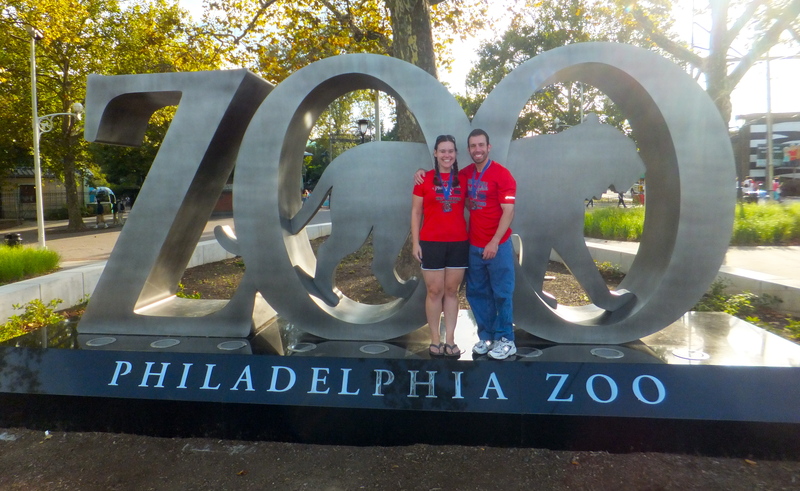 and spent the rest of the afternoon at the Philadelphia Zoo sporting our new shirts and medals before heading back to Jersey. Next up? 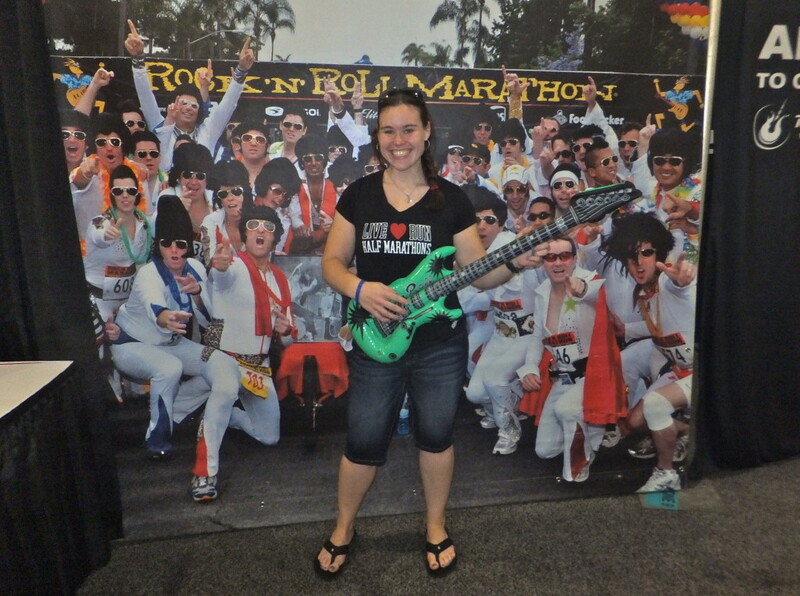 We’re taking on the Rock N’ Roll Providence half marathon! We decided to go for the special “Heavy Medal” you receive for running two of the Rock N’ Roll races, so we’re taking little road trip to Rhode Island…NEXT WEEKEND! I’m definitely hoping for a bit of redemption after this race, but I know it’s going to be an awesome time no matter what! Have you ever run one of the Rock N’ Roll races? Sounds like you had a great race! When I rain it last year, the fam and I went to the Eastern State Penitentiary, which was super creepy and so much fun, and a LOT of walking! I am looking forward to RnR Providence and am determined to finally get a pic with you! I am in Corral 8 which is probably way behind you, but we will have to hook up! Ahh, I’ve been dying to go there! 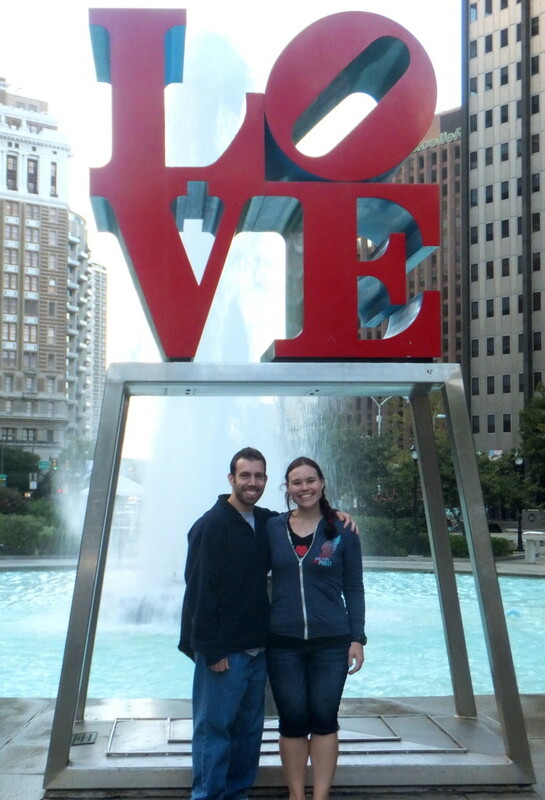 That’s totally something I’d love to see…maybe on my next trip to Philly. YES, I saw on your blog that you’d be running Providence — I am DEFINITELY going to be looking out for you! I’m not sure of my corral yet (we registered for this thing practically five minutes ago, haha) but will keep you posted! We have to finally meet up! Congratulations on your half! I know you were disappointed with your time, but your time is nothing to be ashamed of…especially right after completing Dumbo! You did great! 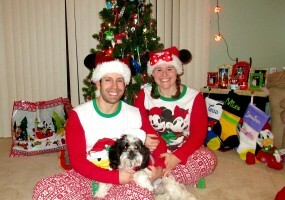 Congrats to your hubby as well – what a fabulous accomplishment!! We run the same, I’m a positive split kind of person, too! Haha! Thanks so much, Karen! I know you’re right…I think Dumbo took quite a bit out of me, haha. EXACTLY — it is downright impossible for me to pick up my pace in the second half of a race, I don’t know how people do it! I’ve been wanting to try a Rock n’Roll race, glad to hear it was fun, I may just need to start looking for one to do (I’ve been eyeing Nashville or New Orleans!). Awesome job by Todd in his first half! And don’t be disappointed with your time, the most important thing is to listen to your body, sometimes aches and pains are it’s way of telling you to take a break! Pushing too hard may lead to a an injury that’ll take even longer to recover from which would be worse! Everyone has good runs and bad runs so just chalk it up to a not so great run day, but through a great city and with Todd (for part of it at least!). I know, you’re completely right. It was still a great time, no matter what, and I need to get better at not beating myself up over stuff like this! It was great to meet you too. Thanks! Glad you saw me! 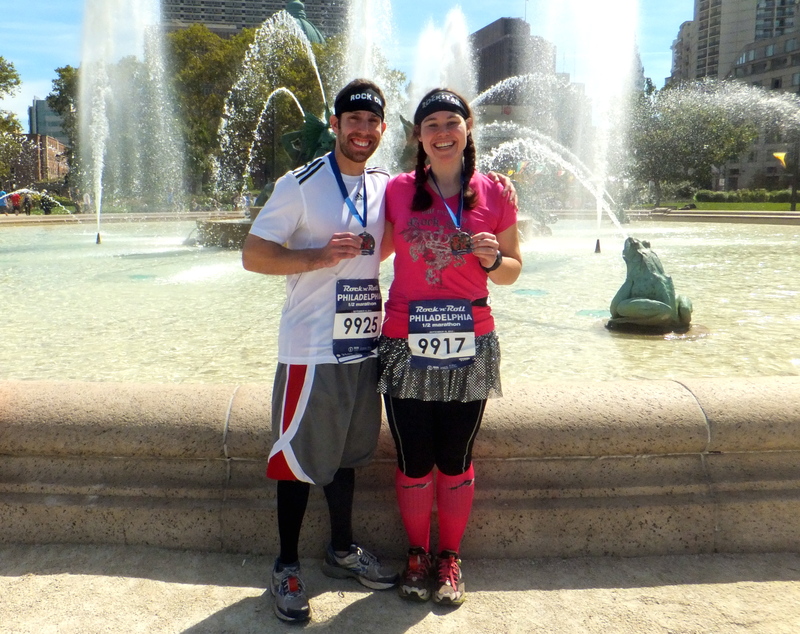 Congrats on your race, looks like you guys had a fabulous time! I sort of had the same experience at RNR Philly as well! But oh well. It was a great course. We were staying at the 4points as well, how funny! It was definitely a fun course, and glad you had a fun time. So sorry I missed you, what are the odds of that?! We’ll have to make a point to try to meet up at a race sometime soon! I want to go watch some of the RNR in Providence. I’ve heard great things about it from friends who have run it. I’ll have to keep an eye out for you! 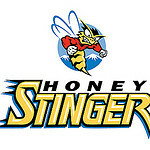 Good luck!! Aw, thanks Lauren! Appreciate it! 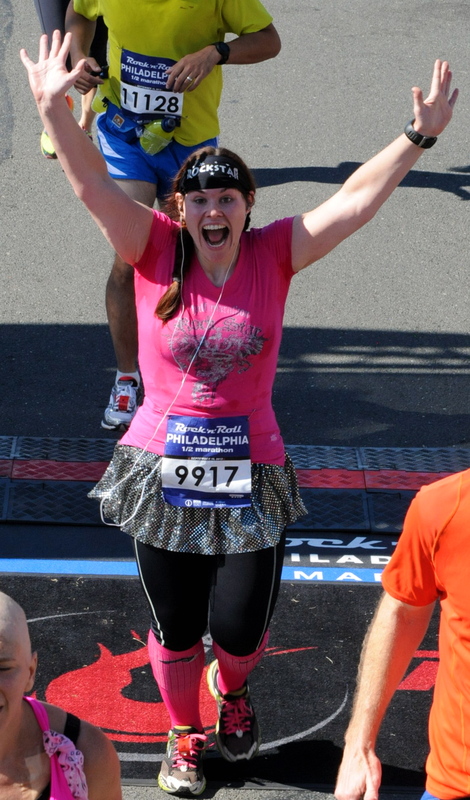 Omg I was at this race! You are gorgeous! Congrats on all your races! Your amazing!! Aw, thanks so much! Appreciate it!